Scientists have measured the composition of oxygen at the birth of the Solar System. The discovery is a vital piece of data for reconstructing the evolution of our cosmic neighbourhood. 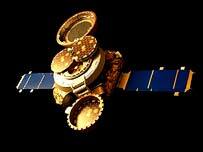 Nasa's Genesis spacecraft spent more than two years collecting oxygen from the outermost layers of the Sun. These layers reflect the composition of the gas and dust cloud, known as the solar nebula, from which the Solar System formed 4.6 billion years ago. The results were presented here at the 39th Lunar and Planetary Science Conference. 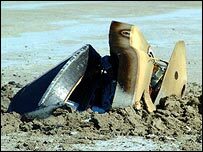 Researchers had feared their data would be lost when Genesis' sample-return capsule crashed in the Utah desert in 2004. 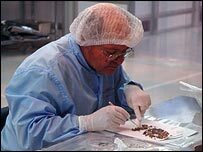 But scientists have been working hard to recover the precious information held in the capsule's collector arrays. The researchers found that the Sun was enriched in the most common form, or isotope, of oxygen - oxygen-16 - relative to the Earth and to meteorites. "We have a very clear signal," said Genesis team member Kevin McKeegan, from the University of California, Los Angeles (UCLA). "It's still early days and these data are not very old; but the experiment has worked." The Earth, Moon and meteorites have widely differing proportions of the three oxygen isotopes: oxygen-16, oxygen-17, and oxygen-18. But the cause of these variations in different parts of the Solar System is unknown. Measuring this primordial oxygen composition establishes an important baseline for understanding how the planets later evolved their different compositions of oxygen. "This was the highest priority science objective for Genesis," said Professor McKeegan. The $264m (£151m) mission spent more than two years gathering ions, or charged atoms, flung out from the Sun. This material is known as the solar wind. It captured these charged atoms from the solar wind on five collecting plates hung outside the spacecraft for more than 800 days in a region of space about 1.5 million km from Earth. The collector arrays were then stowed in a sample-return capsule, and the spacecraft re-entered the Earth's atmosphere on 8 September 2004. Once it had deployed its parachute, the capsule was meant to be caught by a 5m-long hook, wielded by a man in a helicopter. But when its parachute failed, the capsule thudded into the Utah desert, leaving it a mangled mess. But an instrument known as the concentrator had helped protect the sample. The concentrator was an electrostatic mirror designed to focus solar wind particles on to a special target. Its job was to enhance the density of heavy ions, particularly oxygen, that were to be collected. The device gave the atoms an extra energy kick, helping implant them more deeply in the target - away from the contamination which poured in after the crash. The way the device was engineered also helped protect the samples from the impact. "One would not normally characterise the Genesis mission as being lucky, but in this case we were," Professor McKeegan explained. The researchers "cleaned" the top 20 nanometres (billionths of a metre) of the sample with a beam of caesium ions to remove terrestrial contamination. They then measured the composition of the Sun's oxygen in a vacuum. The measurement will be vital for understanding what caused the differences in oxygen composition between the different bodies in our Solar System.